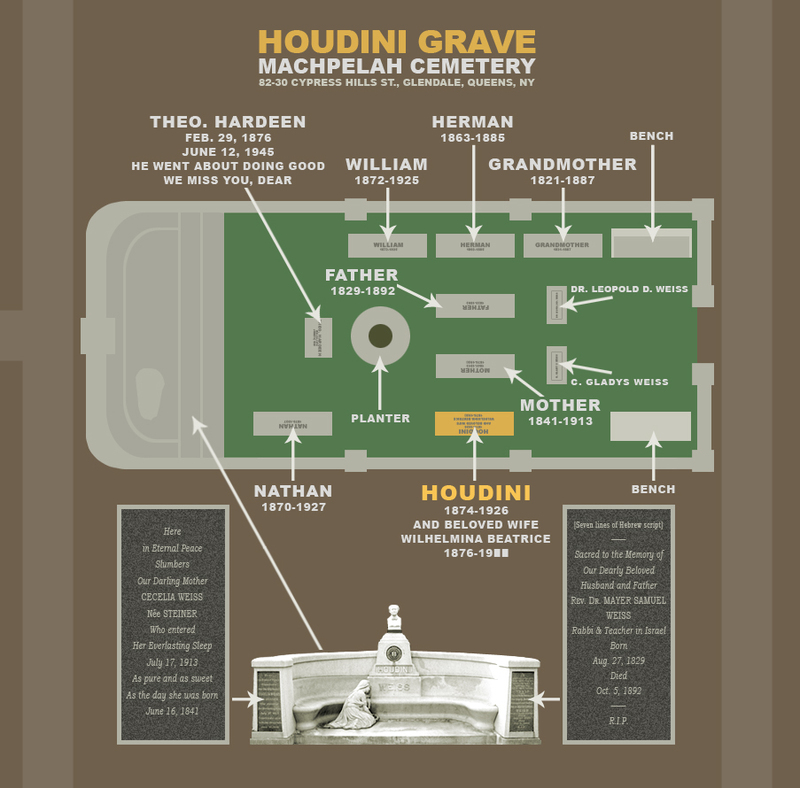 Here’s an aerial map of the Houdini gravesite in Machpelah Cemetery in Queens, New York (see below; click to enlarge). It’s based on my visit to the site around 1990. 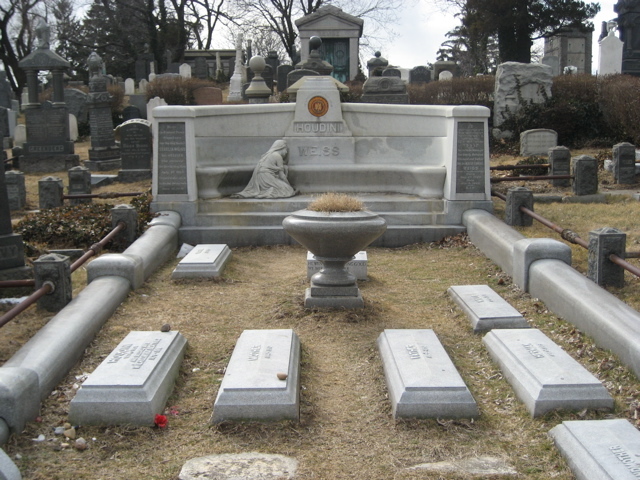 Notice Leopold’s and Gladys’s headstones (Houdini’s brother and sister). As of this writing, the markers themselves are not there anymore. Someone vandalized them in 1994, along with two hand-carved stone benches. According to the manager of the cemetery, the markers will remain in storage until some person or organization can come up with the funding to repair them. 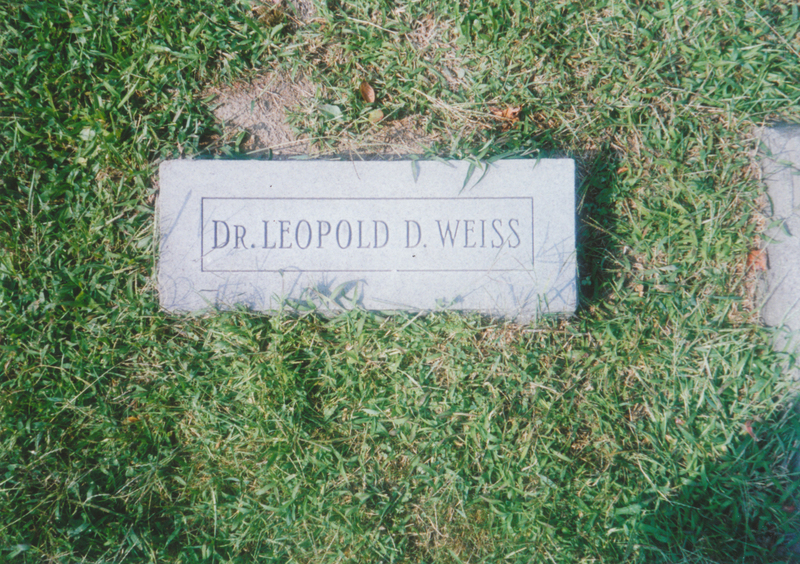 Consequently, many people who visit the plot probably don’t even realize Leopold and Gladys are right there under their feet upon entering from the east side. Also, while Bess’s name shares space on Houdini’s headstone, she’s not buried in this plot. Why? Because she was Catholic, and Machpelah is a Jewish cemetery (yet another example of how religious differences create conflict). So Bess is buried in the Gate of Heaven Cemetery in Hawthorne, New York, about 35 miles north of Machpelah. If Houdini knew Bess wasn’t buried next to him, he’d be infuriated. And the irony is that Houdini didn’t want Leopold buried in the plot because Leo was at the heart of a family scandal: He married his brother Nathan’s wife Sadie shortly after the couple got divorced. Yet there lies Leo with the rest of the family while Bess slumbers underground miles away. Aerial map of the Houdini gravesite (exedra photo credit: Ron Chicken, Houdini Museum, Scranton, PA). Click to enlarge. 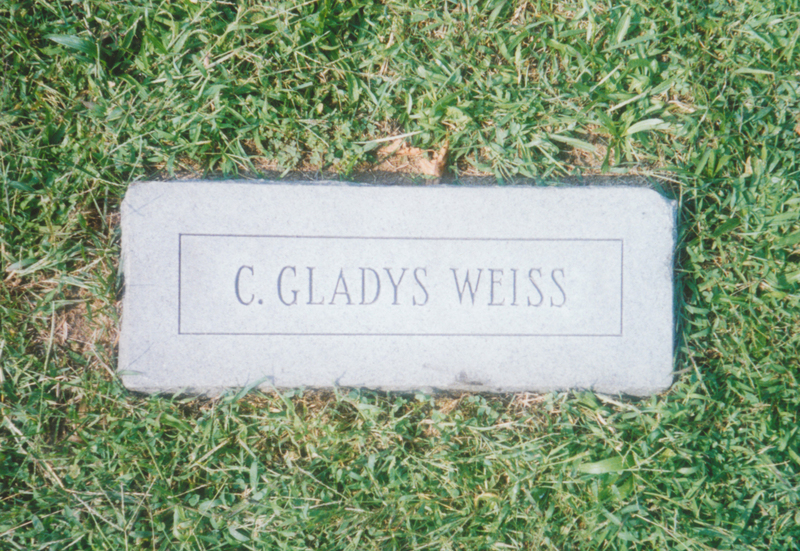 This entry was posted in Cecilia, Death, Family, Gladys, Grandparents, Grave, Hannah Steiner, Herman, Leopold, Maternal, Mayer, Nathan, Parents, Siblings, Theodore (Hardeen), William and tagged buried, family graves, famous, graves, gravesites, harry houdini, magic, magicians, markers, plots, tombstones, weiss. Bookmark the permalink. Great post Tom! That aerial map really clarifies the plot.